An evening dedicated to a degustation of smoke and vapour – the etherial phases of water and fire, infused in a select seasonal cuisine drawn from garden, forest and sea. A synaesthetic experiment where eating and breathing, food and sound commingle and dissolve. What does a smoked mushroom taste like when served on a cloud of rustling polyphony? What sound does a herbal infusion make while evaporating from a hot stone? 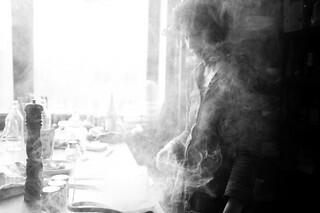 In Smoke & Vapour, we explore sound composition and live improvisation as an integral part of a vegetal menu. While one might be used to conversation being a key ingredient at a dinner party, in Smoke & Vapour we leave words behind to immerse ourselves in the rich experience of eating and listening. We guide the guests through a flowing sequence of tasting environments, each paired with dishes composed as edible soundscapes. An evening of delectable stillness and sensual abundance, where the mundane world evaporates in crucibles of misty flavour, scent and sound. The chefs at work in the kitchen. More visual impressions from Smoke & Vapour can be found on FoAM's Flickr pages. 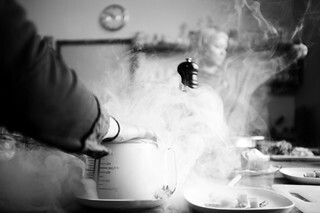 Flow of the Smoke & Vapour evening, including food, drinks, sound, atmosphere and other elements that made up the event.